We recently held our annual art show at the high school. Although I am only posting the pictures of my students' work, we also had musical performances, dance, and other visual arts displays. You have to start somewhere! I post these photos because I love to see how the show progresses. What begins as a room full of tape-balled artwork slowly becomes a gallery of student masterpieces! We begin at 10:00 AM and finished at 3:30 PM, which made me veeerrrry happy, as we usually finish around 5, as people are arriving. Yep, that's me, hard at work. I should have taken more photos of these Laurel Burch animal collages because they were gorgeous. My 1st graders really impressed me this year. You can see the story describing the project posted to the left of the display. Many parents told me that they enjoy reading these and better understanding what we create in art class. Romare Bearden inspired collages made by 4th Grade. These 4th Grade projects took FOREVER to finish, but the results are quite striking. The self-portrait "Hogmawg" is based on the Ohio artist Aminah Brenda Robinson. Vincent VanGogh Sunflowers by 1st Graders. Yes, 1st Graders and they were the first projects of the school year, so they were young 1st graders. Never underestimate the abilities of your students! Modern Winter Treescapes by 2nd grade. I snagged this cool lesson from the "Art Projects For Kids" blog. The Winter Birch Trees made by 4th Grade are always a hit with parents. We used several techniques to make these. I love taking photos of parents and kids looking at the artwork. Hundertwasser's Neighborhoods, based on the artist Friedensreich Hundertwasser and created in oil pastel. Kinders penguin collages. I saw this idea on Artsonia, a great place to get ideas! Notice that I used snowflake printed wrapping paper to cover the display board. This is an inexpensive way to add some pizazz to your displays. Ceramic Owls by first grade. Yet another idea that I "appropriated" from Artsonia. From one of my favorite school sites- Alum Creek. Printed Pointsettias based on Georgia O'Keeffe and made by using cut styrofoam shapes to print. A few ceramic projects- Kinders pinch pots and 4th grade cityscapes. Not sure I will do the cityscapes again, but it was an experiment. These metal masks with hanging beads and clay faces were the hit of the show. The clay faces were inspired by the artist Kimmy Cantrell. They were made by 5th g rade. Most of my displays are arranged by project so that I can hang a sign explaining them. However, I always hang the Young-Fives (AKA Developmental Kindergarten) art all together and add a sign that emphasizes "It's the PROCESS, not the PRODUCT!" 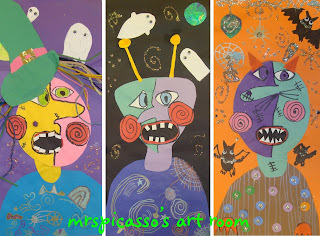 2nd Grade "Picasso Monsters", modified from a lesson in Arts & Activities Magazine, in which only witches were made. Many of the kids loved making vampires this year. I wonder why? Kandinsky Crayon Walk by Kinders. They took their crayons on a walk around their papers, added pattern, and watercolored them. These Wild Things made by 1st graders also included a story they wrote by chosing adjectives from a list and filling in the blanks. This idea comes from Dryden Elementary School, another of my favorite Artsonia sites. And another Dryden steal: Secondary Pumpkin Patches by Kinders. Some Jim Dine Inspired Hearts, which I have blogged about previously. 5th Grade Rainbow Still Life. Color palette was limited to 6 colors, plus black and white. I'll be blogging about this project soon! 3rd Grades made these Frank Lloyd Wright inspired stained glass windows using overhead film and Gallery Glass. Golden Gourds, also created by 3rd Grade- lesson found on the Deep Space Sparkle blog. WOW - amazing! The work is fantastic and the displays look awesome! Very impressive! Great work! What a fantastic art show! There is so much great work! I love the clay faces and metal masks with hanging beads. I'd love to hear more about the process for both of these if you ever post them. Kudos to you for such a great job! Thank you for your comments! I will be sure to blog about the metal masks and clay faces VERY soon. They are a favorite among my students. Wow such good art work!! I would also like to hear more about those metal masks! Unfortunately, I do not have a kiln to do clay ones, but I do have that foil. Did you have to use permanent markers on them? Yes, permanent markers are used. See the instructions I just posted! love your site!! i had to do a monster art show at a former school-and an idea shared w/me by the cooperating art teacher-hang roll paper first on the wall to create an area for each project, then hot glue the work onto the paper-sounds like a lot of work, but with a cordless glue gun-it goes up in no time!! I have been following you for awhile and just now stumbled upon this post. I am gearing up for the Art Show in May and I need some help. How exactly did you hang all the work on the walls? I used Masking tape last year and it worked great! But I was afraid to put work on large roll paper and then have the large roll paper up on the wall with the masking tape. I was afraid that it would fall. Can you give me some tips and tricks? I use masking tape for the walls and push pins for the display boards. My show only has to stay up for 3 hours, so that seems to work. I am released the entire day to work on hanging the show, so I don't need to pre-hang anything on paper rolls. I do know that I have seen an art show hung where they placed rolled paper back to back and hung it from the ceiling. Artwork was hung on this, making portable walls. I hope I explained that cleary. If I happen to find the photo of that show, I will post it for you. Thank you so much. This helps so much! Impressive! what a shame the display stays up for such a short time. truly inspiring.